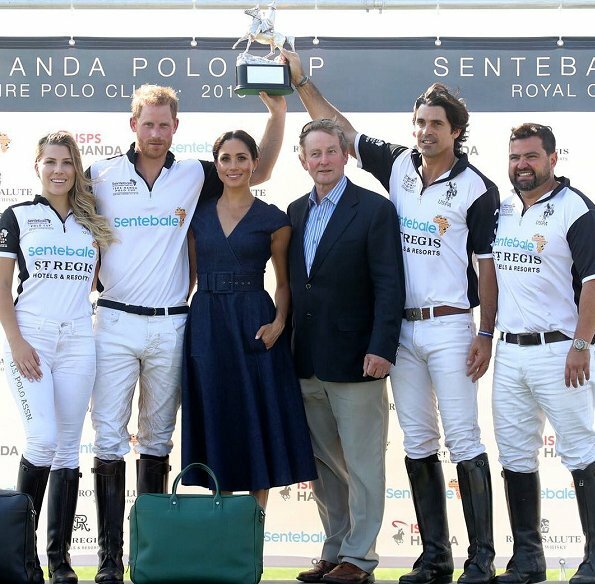 On July 26, 2018, Prince Harry, Duke of Sussex and Meghan, Duchess of Sussex attended the Sentebale ISPS Handa Polo Cup held at the Royal County of Berkshire Polo Club in Berkshire. 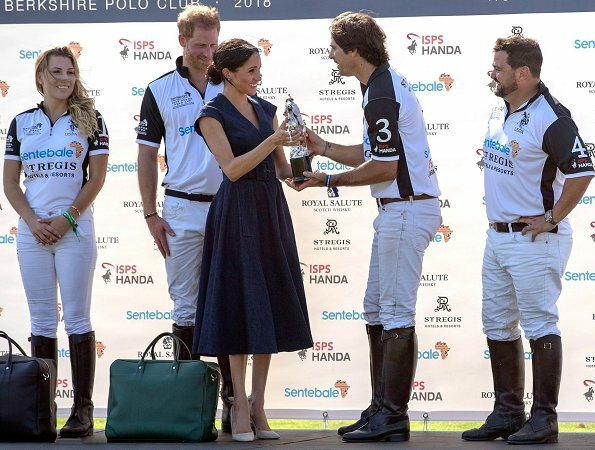 The annual event raises funds and awareness for Sentebale, the charity co-founded by the Harry which supports the wellbeing of children and young people affected by HIV in Africa. Meghan Markle wore a dress by Carolina Herrera. 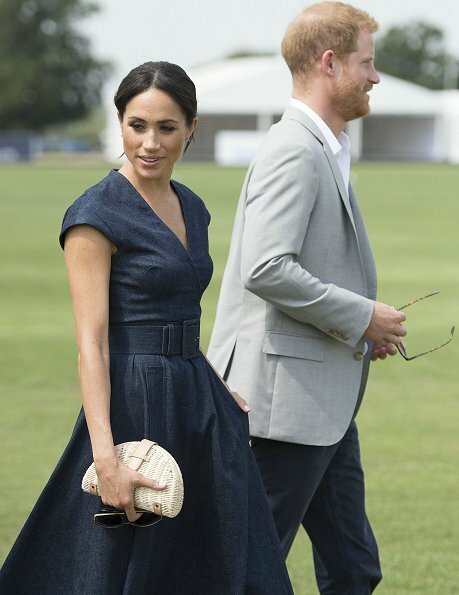 Today's dress of the Dss of Sussex is very nice and well fitting. These high heels for a Polo match is not. I think a semi heel would have been much better,but then I am not the one wearing them. Only MO. Agree, lower heels would have been much better. Completely agree, exactly my thougts I would love to see semi heel. It would have looked just absolutely amazing. How about an espadrille? Otherwise, perfection! 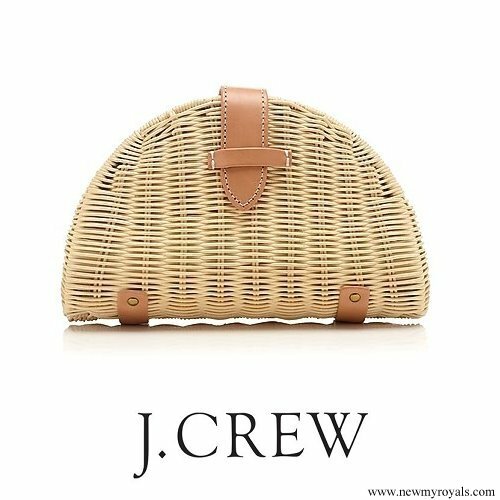 Yes, an espadrille would have been great! She is short. That's why she wear the killer heels just like Kate. Dress is ok. This is very nice dress on Meghan and I specialy like Rattan clutch, it makes her look a bit more casual and not so serene. But I also like the outfit of a tall blond woman, great dress and shoes, sometimes low heels look even more interesting. 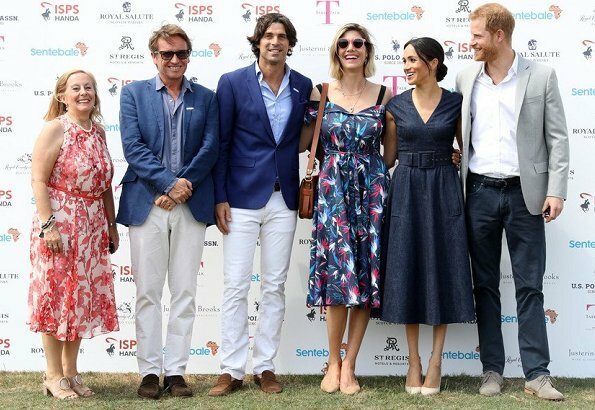 The tall blond lady is model Delfina Blaquier, wife of polo player Nacho Figueras. And both ladies look nice, and as you said small heels are better for this type of events. 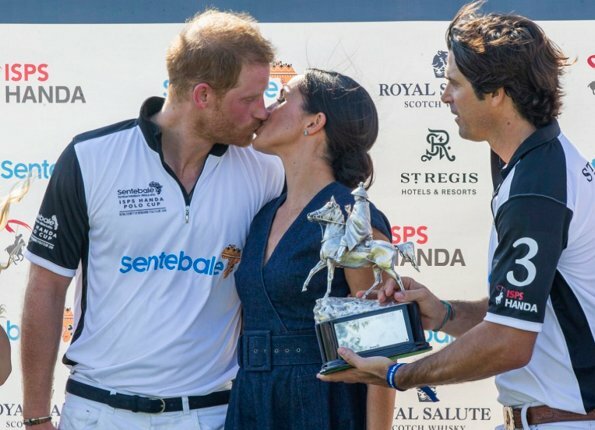 After the Duchess handed out the bambi and got some kisses Prince Harry was jealous. I love this dress on the Duchess of Sussex. It fits her well. I don't care much for the bow thing behind the shoes though. Dress, shoes, bag--love them all. 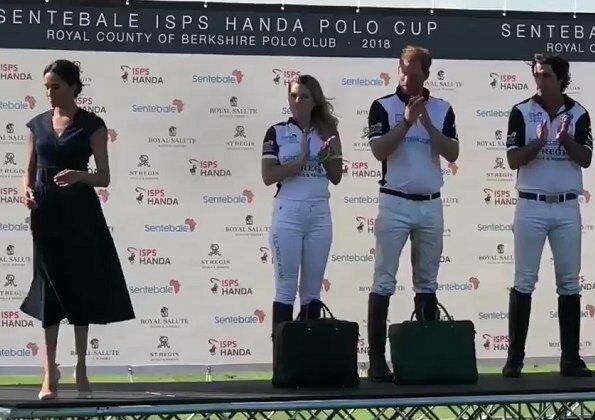 No complaints at all about this outfit (for once i wouldn't even say it would look better in a brighter colour) Meghan looks fabulous. The dress is really nice and all her style looks really good here. I’m not loving the look and also the relaxed attitude. We get it, you’re modernizing the crown, but I feel hugging like that for a picture and the kiss is to much PDA for royalty. I know I’m gonna be criticized, but why do we have royalty if they gonna act like commoners. Royalty must be over dignified. And I do love this two, but save the PDA for your house. No criticism here. I completely agree with your PDA comments. Meghan could learn a lot from the example of Countess Sophie. While Sophie may have started her royal life with a misstep, she has since represented the family with dignity and grace. And btw she is not anymore clingy than Harry. Those that have spent much time w him say he has always been touchy feely like Diana. He loves affection. He grabs her hand just as often. He in fact as stretched his body out so he doesn't unlock hands. Btw Meghan is very confident and really doesn't need her hand held because she is scared or afraid. Have you seen her interviews? She is not a shy timid girl. Just be happy for Harry... so much sadness...he is happy. Thank you Mrs M, love it ! Thank you, Diane! The video makes the quick and sweet kiss clear. What a strange thing to object to! They are a happy newlywed couple. Harry was born into the royal family and he is a very demonstrative person and always will be. It has nothing to do with "modernization". This is his nature and he is clearly loved and respected by his family and charities. Meghan should be, too. Diane - thank you, well said! Agree 100% with you Diane on both your posts. The excessive criticisms on tiny insignificant details while ignoring the positives by some posters makes me laugh out loud. Some people search for things to be miserable about. Some like the kiss, others do not. EVERYONE entitled to their own opinion. What does "PDA" mean? "Polo, Drugs, Alcohol"?? Can anyone explain to the uninitiated? It was not even a 'kiss', I mean like a 'Kiss', it was a quick peck, not even a second. It was just a way to congratulate the players, she first gave the other player two quick pecks on the cheeks, her husband earned one on his lips....why? Because it is her husband :-))) It its natural. Well done Meghan and Harry! They seem to be normal people. Public Displays of Affection, Coralie. But I quite like your suggestion - would certainly some of the commentators even more ruffled! Peridural anaesthesia - I don't know any other meaning of this shortcut. Agree with AnonymousJuly 27, 2018 at 1:39 PM and Diane. Harry and Meghan are a mature and make a perfect team. In regard to the comment "why do we have royalty if they gonna act like commoners"-- royalty are human beings. They are not gods, they are not 'better-than', they are people with titles. Now that the ridiculous, outdated practice of arranged marriages between royal families has ended, we see happier marriages (and an end to inbreeding). Marriage for love, not duty. What a concept! Is it really so wrong to finally have a couple show some affection? It seems to me that they are setting a wonderful example. I would much rather see that kind of marriage than Charles and Diana's. That was a perfect example of pushing the "right" girl into a marriage with the future heir, all for the sake of appearance. Thank you, ladies, for the explanation of that PDA-thing. I am always happy to learn something new! Il me semble inadmissible qu'une robe tellement chère soit si mal ajustée sur les épaules, la taille et le buste. C'est une belle robe, mais la partie supérieure ne lui convient pas. D'accord avec Unknown. C'est charmant! La Duchesse est vrai femme. 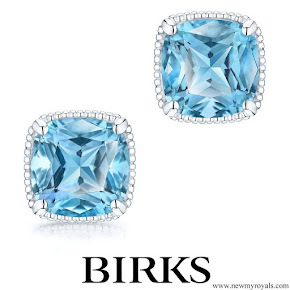 She has 8 million revenues through the series "suits". Lovely dress. I would suggest to Meghan that for an occasion like this a lower heel (possibly a block heel) would be so much more comfortable. Save the stilettos (and feet) for more formal occasions. You make a good point Unknown. I agree with you. So many of these comments about her shoes are the just the personal preference of the writer, what they would wear because they can't wear heels. She was a public person before marrying Harry and knows how to dress and be photographed to their best advantage as a couple. Guess your clear name is Grand. I thought it was your name too! At first I thought "for once she isn't hanging on him". Then I saw the kiss. Meh. It was a very quick kiss, and they both kissed. Watch the video. she looks Perfect. You go girl. This is the prettiest I've seen her look, and that includes her wedding day. Dress is a great color, gives her a feminine shape, her hair is neat (but she still has to play with it). She looks lovely. Diana kissed Charles once on a polo-event. I like this dress. It is amazing for her figure! She looks lovely, dress, earrings, bag, sun glasses. The only thing I would like to change are shoes. Love love love everything ! The dress, shoes, hair, bag, but especially that kiss ! Swoon ! Is this royalties are for? Metoo for women who believes they are fashion polices needs. Love the dress - very elegant with a bit of a vintage feel to it. 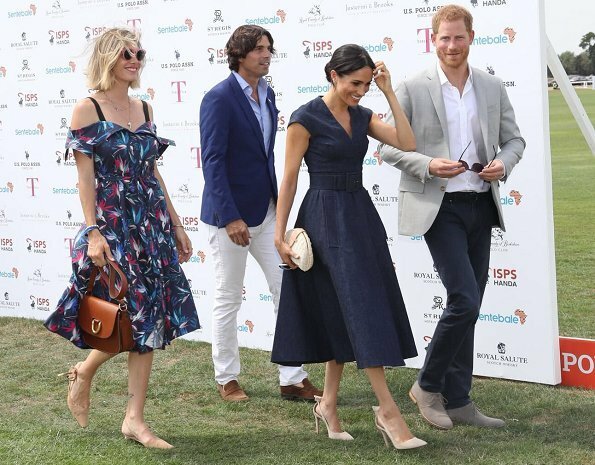 I don't mind the shoes but I thought normally it was not a good idea for polo to wear stiletto type heels - not helpful for stamping the divots or whatever it's called! Although, I suppose it's not a problem as the ground is so hard at the moment with the heat. Delfina Blaquier looks lovely as well - I like the peep shoulder. The Jeans dress is very lovely. The high heels not so much in a grassy place.Dss Meghan has very thin legs, so high heels are not the best for her, this is not to be nasty,just a fact. It is being nasty. That is like saying women with large legs have no business wearing high heels either, which I doubt you would ever have the nerve to tell someone. Since when is there a proper leg size associated with heel height? And out of curiosity, what is the proper calf circumfrence to inches per heel ratio? Since you state that this as a fact, I am most interested in your expertise. I happen to be a women with bird legs. 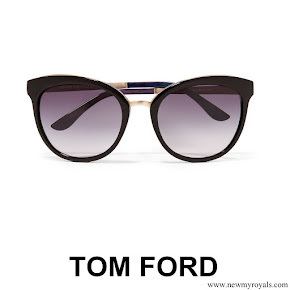 I would hate to be guilty of another fashion felony now that I have been educated. Love the dress, the clutch and the swift kiss. Agree that a pair of espadrilles would have been just perfect! Way to go Meghan, keep being yourself.